an amazing seven vocalists, both male and female. Random Axis' play list culls from contemporary dance hits by artists such as Outkast, Beyoncé Knowles, Maroon 5, Usher, No Doubt, and U2; Classic 60's Rock and Soul by Aretha Franklin, The Temptations and Van Morrison; 70's Disco from Kool & The Gang, Donna Summer and Earth Wind & Fire; 80's Pop and New Wave by Don Henley, Duran Duran, INXS and Howard Jones; Big Band, Combo Jazz and Jazz Fusion from The Glenn Miller Band, Miles Davis and Kirk Whalum. 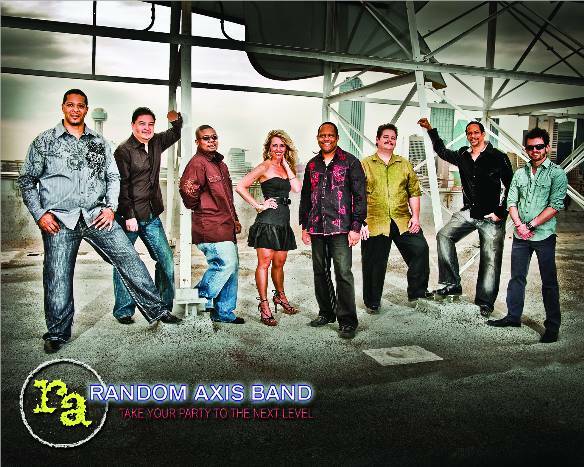 With more than 15 years in the Dallas music scene, Random Axis Band is able to tailor their set lists for any client or function. The band regularly plays for corporate groups and wedding receptions, large and small. Anyone attending a Random Axis performance can expect a party they will never forget! "The band was more than we could have asked for! The dance floor was full all night! I think a lot of people had holes in their shoes from all the dancing! Thank you for making our wedding very memorable!" "Very high quality group & accommodating to suggestions". "The band was excellent! Everyone was dancing and having fun. We were very pleased with their performance." "Music selection and progression from dinner to dance/party was perfect! "We couldn't be more delightful with Random Axis Band. They were incredible! I don't think there was one minute that the dance floor wasn't full and alive! ...they were wonderful to work with. The band looked fabulous, played incredibly well. They are a class act - talented, energetic, and clearly professional. The music was outstanding!!" ----- David & Lynn P.
"Hi Carol: Just wanted you to know that our daughter's wedding last Sat. Oct 5th was a huge success, in large part because of Random Axis. They were terrific. They were great to work with and they put on a super performance. Our guests haven't stopped talking about the reception party. Many have said it was the best wedding they have ever attended. Thanks for all your help."